Flexible and transparent AMOLED displays should finally start escaping the research lab confines and making it into gadgets next year, as Samsung mentioned, but while we are waiting, the Koreans outed a concept video of what a flexible transparent 3D AMOLED display combo can bring in our lives. It is about an AMOLED tablet concept that opens doors for you, provides you pick-up lines with cute girls, and entertains you to no end, all the while it apparently fits in your pocket until you take it out and unfold it. We are not quite sold on if the transparent 3D AMOLED demoed at CES this year can lead to the pseudo holograms we are seeing in the video, but it doesn't hurt to dream on. If this ain't innovation, i dunno what is.. This takes the concept of Corning's new glass products. If you YouTube "Corning A Day Made of Glass" you will see a transparent phone. This video was posted 10 months ago. 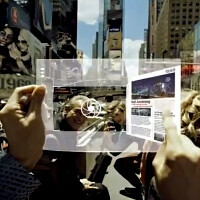 So I can see flexible displays, tablets, etc as part of our future. So what?! Corning produces glasses not phones nor tablets. And there's a lot of concepts like this on youtube. I myself once think of a phone like this when I was a kid, as well as flying cars, PC lenses and holographic tv. But no one before Samsung, has the technology to concretize this concept! samsung has the money to from the sells of the galaxy s line :) goooooo samsung!!!! Forgot to add this SleepingOz...do some research, the US military has been testing a "flexible display" for over a year now...manufactured by HP. Last time I checked Corning was not in the business of building cell phones or tablets so not really sure how this compares to day dreaming as a kid. Gorilla glass was developed by Corning so I guess ... who cares we have scratch resistant glass? Guess the cell manufactures made the glass. As for the Corning video, you really need to do some research. The glass for the windows is not being used for commercial buildings that not only help with heating / cooling but can generate electricity as well. Samsung, Apple, and others for the most part adapt technologies developed by other manufactures. If they didn’t, neither you nor I could afford to pay for the development cost of phone or tablet. Ever had a chance to visit a Corning R&D lab? Everything in the video is possible and has already been produced in some form or fashion. Someone give him a cookie..
Now THIS is a usable concept! Unlike nokia's strange videos a few weeks ago.